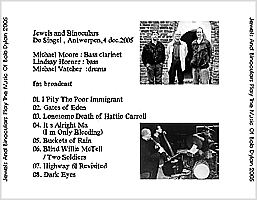 Live at De Singel, Antwerp, Belgium, December 4, 2005. Bob Dylan has made such a deep impression in the music scene that not only contemporary pop/rock singers cover his songs, jazz musicians too have covered his songs. One of those who gave the Dylan repertoire a jazz reading was Keith Jarrett who performed tracks such as Lay Lady Lay and My Back Pages at a concert in Denmark back in 1969 (click here). 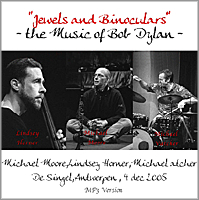 In 2000, the group Jewels And Binoculars (made up of clarinetist and saxophonist Michael Moore, who is based in Amsterdam since 1982, bassist Lindsey Horner and percussionist Michael Vatcher) recorded Jewels And Binoculars: The Music Of Bob Dylan (Ramboy). In the album's liner notes, Moore remarks how Dylan blends traditional song forms and unique visual imagery and explains that Jewels And Binoculars sets out to explore both the melodic roots of Dylan's songs and the poet's vivid palette. Five years later, the trio revisited the Bob Dylan vault in Antwerp, Belgium. They reprised I Pity The Poor Immigrants, Two Soldiers, Highway 61 Revisited and Dark Eyes from the 2000 album while showcasing "newer" tracks such as Gates Of Eden, Lonesome Death Of Hatti Carroll, It's Alright Ma, Buckets Of Rain and Blind Willie McTell. The last three songs would appear on the group's 2007 album, Ships With Tattooed Sails, featuring guest guitarist Bill Frisell. More like a chamber trio for late night listening, for those who think they know their Dylan, the rasping singer will never be the same again. For jazz fans, with smouldering tracks that seem to build and build, this will be a delight. 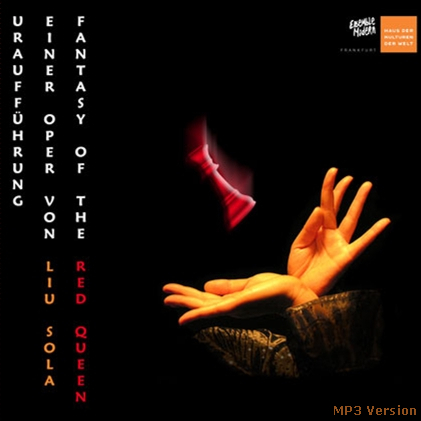 Thanks to the seeder who shared the excellent, lossless FM tracks on the internet. Click here to order Ships With Tattooed Sails.